Ok, minions. Are you ready for this? I’ve had the overwhelming urge to bee keep lately. And whatever look you just gave the computer, 30 people have given me in the past two or three weeks when I express interest. But bees are awesome. And they’re crucial to the things that mean the most in my life: food. Without bees, there would be no pollinating (unless you count those NASTY creatures called flies). And I kinda, sorta love them. A lot. 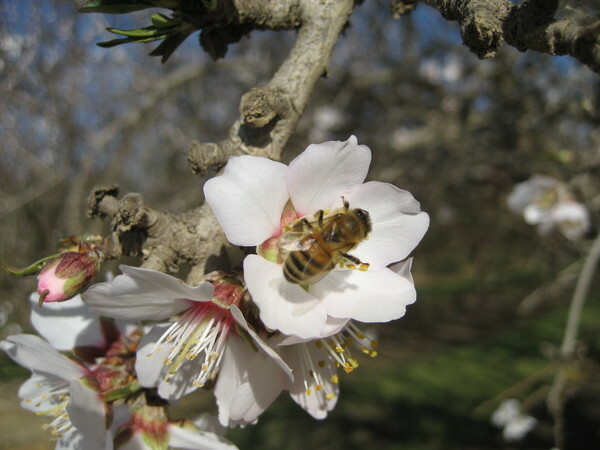 Did you know a lot of farms (especially almond farmers) rent bees during February/March to pollinate their trees? They do! I wrote all about it last year on Coronado Patch. The particular farm I wrote about (Hopkins Ag) has 4,000 hives come in. 4,000. These tiny, fuzzy creatures are responsible for producing yummy almonds, amongst other tasty crops. Kinda crazy. And for some reason, people fear bees? They say it’s because of the stinger, but I’ve met plenty of people who sting much worse than a tiny little bee. Um, and how can you be scared of something that produces honey? I mean, really. If you need more convincing, go to your Netflix account (and if you don’t have Netflix…well, how else are you getting your Saved By the Bell and Dawson’s Creek fixes?!) and watch the documentary Queen of the Sun: What Are the Bees Telling Us? It’s a look inside the necessity of honey bees, colony collapse disorder and beekeeepers all over the world. It’s well-worth your time and I promise you you’ll fall in love with the cute black-and-yellow guys (Ok, who just started singing Wiz?). And it will definitely make you appreciate your food that much more. Thank you, honey bees. You are magical and oh-so-necessary for us. Queen of the Sun states that every farm should bee keep on their property. Any farms out there reading this, I’m totally willing to start one up on your farm. Seriously. Fun Fact: “Melissa” means “honey-bee” in Greek. Hello, fate.